Even mature dreads have loose hair at the roots but using the Clockwise Rubbing tecnique you can create new knots right where it’s needed and keep loose hair down at a minimum. When Clockwise Rubbing is churning correctly there is very little pressure on your dreads and you only need to do it a few minutes. It is 100% safe for your hair. Before using this technique, your hair must be clean and free of grease to dread up quickly and easily. Hold your dread between your fingers. 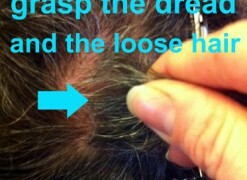 Hold the dread at the root about 6 cm – 1cm from the scalp. Gently press it between the sides of your 2 and 3 finger . Gently press the dread to your scalp and leave at least 3 cm be free to form new knots. Rub the dreadlock clockwise in circles, along the way you can switch hands but remember to rub the same way. 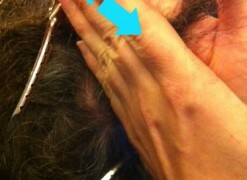 Vary your grip and rub while holding dread from different locations within the loose hair. See a more detailed guide for maintaining dreadlocks here! Two reasons. You want to ensure that you are always going in the same direction, even if you change hands. Clockwise is preferable for the anti-clockwise, as 80% -90 % of the hair swirl patterns on the scalp is clockwise. Rubbing the hair around in this direction for it to work with the natural “pattern” rather than against it. After less than a minute you should have a little ” hairball ” or a new knotted hair at the root. 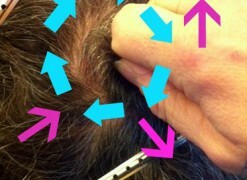 The point of rubbing against the clock to create knotty tuft of hair – not a dreadlock . It is important to note that it is not possible to rub a dread to the world. In time and with your help these knots compress and tighten up and become indistinguishable from the rest of your dread. If in the course of 30-40 seconds is not formed any knots and nothing changes you should adjust your grip, try less pressure, etc. If knots are still not formed, you will need to make sure hair is properly prepared for dread’ing. As soon as you’ve got a nice wad of knots you can roll it between your fingers or palms (whichever seems appropriate ) terminal / roll it into a form that is a little more dreadlock -ish. After all friction has been done, you have fresh knots everywhere and they want to alert you to help them to tighten up. Work a small portion wax or gel in the fresh knots and give each about 30 seconds palm rolling. With a pampering like this you can be sure that these hairballs soon will tighten up over the next few weeks. Try to palm roll them now and then while they are starting to dread up. Check out this video about clockwise rubbing and maintaining dreadlocks.